I haven’t run across many candy movie/TV show tie-ins that are good. Usually, they’re somewhat of a PR re-branding effort, rather than an inspired decision. 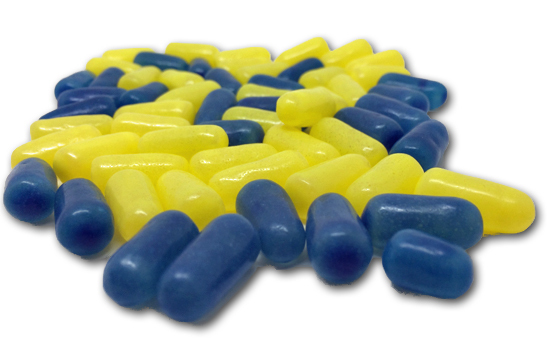 This time however, Mike & Ike struck gold. We’re all familiar with the “Despicable Me” movies, right? 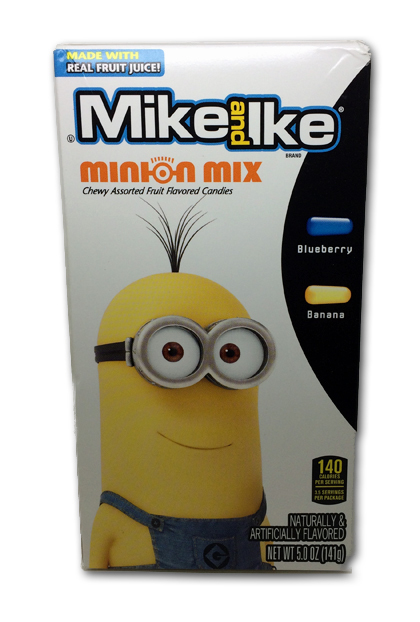 The loveable Minions from said movies are getting their own film due out this summer, and to celebrate, the dudes got their own limited edition box: Minion Mix. If you have seen the films, you know that the boys are obsessed with bananas. So obviously, that’s one of the flavors. It’s a bit daring of Just Born (the makers of Mike & Ike candy), as banana is pretty specific, and not everyone’s fave. Going even deeper off the far end, they paired the banana not with the predictable blue “blue raspebry” ubiquitous flavor, but instead with blueberry- a woefully under-represented flavor in candy these days. Banana & Blueberry. That’s it, and they’re marvelous. I didn’t think I’d like these, but I love them. The banana is spot on-sweet, with that earthy, tropical flavor. They’re very full tasting, and for a mass produced candy, pretty damn natural tasting (no comment on the natural-ness of the ingredients). The blueberry in contrast, is also sweet, but with just a slight tart edge to it, just like real blueberries. The combination of the two work so well together, I’m kinda surprised in hindsight that I’ve never seen these two flavors combined before. So we have a winner. They’re available now all over the internet, and I highly recommend that you pick up a box. In other news, I just wanted y’all to know that Bob is my favorite Minion.